When upgrading an SSL cert last week i had to run the Exchange Hybrid Configuration Wizard again. Of course when you update something like this or the AD Connect something is broken…. Before the Free/Busy was working from Microsoft 365 Exchange Online to the On-Prem environment. After checking the relationship i saw that the sharing code was empty again. Resulted in an empty response. To fix the Free/Busy time this needs to be filled in, in there are subdomains. If you have let’s @test.com it’s fine, but if you have @nl.test.com it goes wrong. Because it tries to reach autodiscover.nl.test.com instead of autodiscover.test.com. Even if you have some CNAME records, it takes to long. After this, the Free/Busy will work again. Often when we you buy / get a new certificate you need to have another certificate depending on your needs. The PEM format is the most common format that CA’s issue certificates in. PEM certificates usually have extentions such as .pem, .crt, .cer, and .key. They are Base64 encoded ASCII files and contain “—–BEGIN CERTIFICATE—–” and “—–END CERTIFICATE—–” statements. Server certificates, intermediate certificates, and private keys can all be put into the PEM format. Apache and other similar servers like Citrix NetScaler use PEM format certificates. Several PEM certificates, and even the private key, can be included in one file, one below the other, but most platforms, such as Apache, expect the certificates and private key to be in separate files. The DER format is simply a binary form of a certificate instead of the ASCII PEM format. It sometimes has a file extension of .der but it often has a file extension of .cer so the only way to tell the difference between a DER .cer file and a PEM .cer file is to open it in a text editor and look for the BEGIN/END statements. All types of certificates and private keys can be encoded in DER format. DER is typically used with JAVA related platforms. Today busy with some Policy Based Routing (PBR) routing on an HPE Aruba 3800 series switch. The default gateway is set to 172.16.1.1 which is ISP A a line dedicated for business traffic. Let’s assume that we have another ISP, named B which needs to used for Office 365 in particular Exchange Online. Of course the best option would be to change the default gateway because Microsoft has a lot of IP addreses which are changing on regular basis. So my advice would be to set the default gateway to ISP B and make a PBR for the things that should go to ISP A. Users of VLAN 5 needs to have this in place. We start by creating a Class which contains the IP version 4 address for Exchange Online listed on this Microsoft page. The class name is case sensitive, also please not that we can’t use normal subnetmasks (the switch accepts it, but it’s not working) we should use Wildcard masking over here. Now we have a class we can bind it in a policy and set the next-hop to 172.16.1.2. 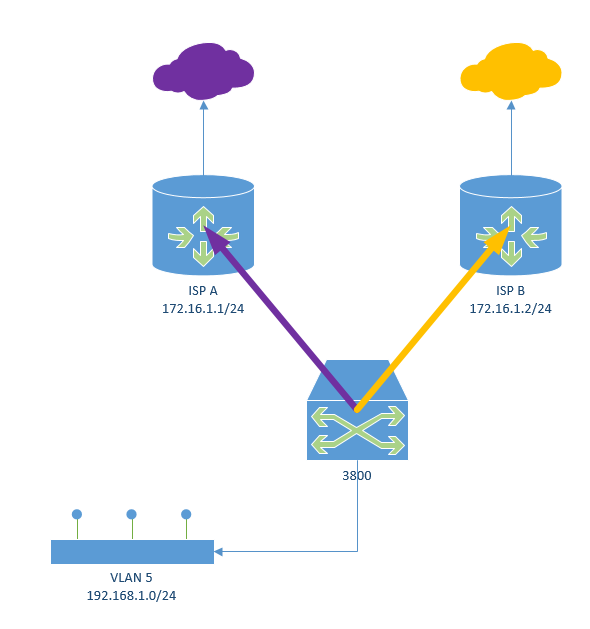 Keep in mind that you only can bind one PBR to a VLAN. You can enter again the command service-policy “POL-test” in and give enter, you won’t get a warning but you simply override the PBR. Also you can only set the PBR to incoming packets on a VLAN. With version 6 > the default password is changed and not listed (yet) in the Cisco documentation. Dwain Hutten – IT Pro | Powered by Mantra & WordPress.